Getting Longlisted for the John Moores Painting Prize is huge for a local artist, seeing the competition on your doorstep every other year, seeing new waves of contemporary art move in and out as the winners are selected. Pete Clarke, found out in April that he had been selected from over 2,700 entries to show as part of the John Moores Painting Prize 60th awards exhibition, so we sat down in his Bluecoat studio and delved into the history behind the work going on display at the Walker on 14th July, as well his wider collaborations that have led to the work he is displaying at the former George Henry Lees building for the Independents Biennial, launching the same day. You started your career in Burnley didn’t you? 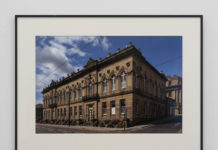 It used to be Burnley College of Art. I was brought up in Nelson, but Burnley was the closest centre. Up to the late 60s virtually every town had a college of art. And then there was the Coldstream Report which created the regional centres, and a lot of places became foundation courses. I was only 15, so I did my foundation. It was great, really hardnosed, taught by a lot of guys from the Slade, who were part of the British tradition of heavy drawing, so everything was quite small, and then I applied to Bristol. So I went off to interview in this Italian mohair suit and Paul Weller haircut. And this American artist lecturer said “What’s a little boy like you doing applying to a big college like this?” I couldn’t have done that badly though. I stayed there for three years. Do you ever go back to Burnley, or Nelson, with your work? When you see things like the John Moores Painting Prize, it’s quite easy to guess an artists’ history; to cut their legs off and count the rings. You can almost locate how old they are and which college they went to, who taught them. So obviously the stuff I do is massively influenced by my foundation course, that English drawing, and of course Bristol was a very well-known figurative painting college. Stuff that would be anarchic now, but there was really heavy formal drawing. We weren’t allowed to touch colour ‘til Easter. In fact funnily enough, I do a project with a German artist, Georg Gartz, and I work in residence in Germany in Ebernburg – it’s along a tributary of the River Rhine, where Turner worked. I ended up working with Georg because of the classic question, are you ‘you’ because of you, or are you ‘you’ because of education? And I supposed I’m this British hard wood image. The painting in John Moores this year is a series of ten that took me a year. Georg can do ten in a week. Also, the German art scene is amazing, they’re very supportive, and ordinary people buy work. 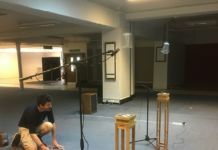 What made you move your studio to Bluecoat? 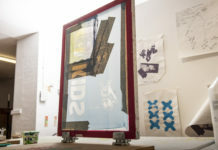 I was working at UCLAN, mainly print making in their studios, with Georg, and of course I’d use the workshops making canvases, stretchers whenever students were away, but I’ve always had studio spaces away from that. I think it’s impossible not making work and being a lecturer, so I was very strict about making work and not just having the day off on my research days. Because I make a lot of drawings and print making, and it’s Preston so it was impossible to drive out between half 3 and 6 o’clock, so I would stay most nights until 7/8 o’clock. 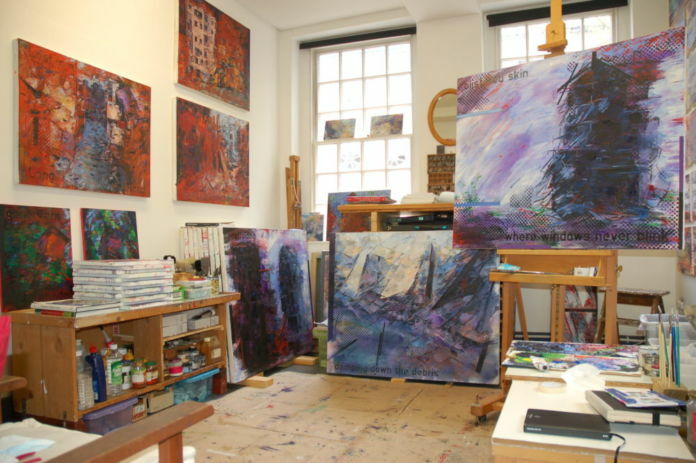 I’ve tried other studio spaces, but there were practical things, like at Liverpool Artist Workshop, it was so cold that my paintings would never dry. And open studios can turn into surrogate art schools too, but I like the privacy at Bluecoat, having my own space. And anyway, it’s great to be part of Bluecoat. It’s a very stimulating space, including the support of Bryan Biggs over the years. You’ve worked closely with Bryan Biggs a few times though, in Cologne too? 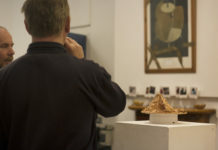 Bluecoat had a historic relationship with the BBK Gallery in Cologne – a professional artist association, which as well as running galleries they also act for artists so they would help you with taxation, and through the BBK you can register with the local authority and have pension rights. I was in a show with the BBK in the late 80s, and in the late 90s Jürgen Kisters wrote for the local paper there, the Kölner Stadt Enzeiger. As a critic he was obsessed with Liverpool, so he created this festival of Liverpool artists in Cologne, which he called Eight Days A Week. Bryan and myself and various Liverpool artists organised a show in Liverpool as a reciprocal thing, and it’s been running on and off ever since. And Turner’s Travels came out of the Cologne collaborations too, what led to that? We’ve done this project for years. When Georg first visited Liverpool, he came across the Turner Prize. He never thought of Turner as a British artist. He thought he was far more representative of German movements and German art. He thought Constable was the more British. So since 2007 we’ve followed Turner’s journeys along the Rhine, where he worked, following his path, and then the following year we went around Yorkshire, then Venice, then to the Isle of White, then back to the Rhine, making work where Turner worked. And out of that we were invited to do this residency in Edinburgh, where he made some amazing paintings. This is the first time you’ve been longlisted for the John Moores Painting Prize, have you applied before? Well I applied in the 90s off and on. One of my favourite paintings was influenced by this Poussin picture in the Walker, The Ashes of Phocion, which hangs in my living room, and I sent that into the JMPP years ago and didn’t make the cut. I mean it’s a difficult competition, because it’s subjective to an extent. On a practical basis it’s a great opportunity for Liverpool artists. I mean, you go to the show, and look at the winners over the years, and it tells you a lot about contemporary art, just the scale of the unapologetic confidence you get in some of them. And also I suppose, how else are you supposed to tell people you make paintings. How would you describe your paintings? Well funnily enough a friend of mine described my painting as a mix between British impressionism and Russian constructivism, which strikes me as about right really. The longlisted painting is one of a series of ten which is loosely associated with Liverpool as a city, but more so about the changing nature of the city and the notion of the everlasting uncertainty of things that get knocked down and re-built. I’ve lived in the city long enough now to get lost again. When I go to certain areas, there’s been a complete new set of buildings. I’ve always been fascinated by the notion that art has a text – whether we look at paintings or whether we read them. The different languages dislocate each other so you have to reread the paintings. The words fragment the narrative.